The June SNU rally will be Green Creek near Bridgeport. The dates are Thursday June 27 – Sunday 30, 2013. This is a new location for us. It is a dispersed NFS site near a creek. The elevation is around 7900ft. The rally site coordinates are (38° 06.977’ N, 119° 15.41’ W) . Wheels and Doris plan on arriving early so look for their Airstream. Unless there are fire restrictions in place, bring wood for campfires. See the rally photo gallery! Lifehacker has a rundown on How to Get Rid of Ants. One idea is to get a good picture of the villain and send it to your local university extension service to identify. As they say, wars are won by knowing the enemy. That is the first step towards eliminating nests and trails and access points. If you get an infestation at a campground, it can be difficult to get rid of ants that got into the RV. That means you need to be aware of any ant hills near your campsite and to watch carefully any access paths. At least with an RV, the means of ingress are a bit more limited. Rocky Point East at Eagle Lake is the site of the May Rally. The dates are Thursday May 16 to Sunday 19, 2013. To get to the rally site from Susanville travel north on Highway 139 for 30 miles. Turn west (left) on County Road A-1 and travel approximately 5 miles. Turn south (left) on Lakeside drive in the Bucks Bay subdivision. Drive past some houses. 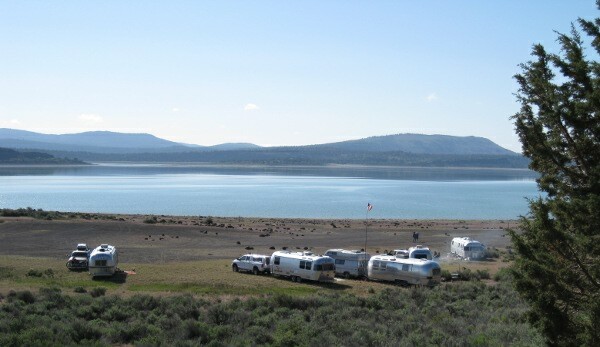 There are various camping and other BLM signs including a BLM sign saying Rocky Point Fishing Access. Follow the road around Bucks Bay to the rally site. Be sure you are heading to Rocky Point East. Bring wood for campfires.